Choosing the right tennis racquet can make a huge difference for your game but its not an easy task, specially with all the racquet options available. This is why our experts at Tennis Plaza have developed this simple guide to help understand the basic concepts you need to know before going shopping. The Grip Size refers to the circumference around the racquet’s handle. It is measured in a scale from 0-5, 0 being the smaller and 5 the largest. (see below). There are plenty of videos on the internet that illustrate how to determine your grip size, but there’s no science to prove this. Usually we tell our customers that the best grip size is the one that you feel more comfortable playing with! Bear in mind that a small grip size can always be made bigger by using Overgrip Tape (thin padded tape that wraps around the racquet’s handle) but you cannot make a larger grip size smaller. So DON’T buy a grip size that is too big for you! Decades ago it was common to see pro tennis players using large grip sizes (4 and 5) but over the years this practice has changed since smaller grip sizes allow players to generate more spin by increasing maneuverability on the wrist. Rafa Nadal for example, uses a grip size 2 racquet allowing him to perform spin shots a lot better. The traditional length for a standard tennis racquet is 27″ inches, though today is common to see 27, 5″ racquets and even some climb up to 28″ in length. These larger racquets are usually called “plus racquets” and are used by players who are looking for more reach on the court. For juniors there are also smaller racquets that range between 19″ to 26″ inches long. Racquet weight and balance basically influence how the racquet feels when you swing. Most racquets today are made from Graphite since it’s a lightweight material that kills vibration and provides great feel when striking the ball. There are also racquets made from aluminium and titanium, but they don’t perform as well as graphite since these materials don’t absorb shock as much as graphite does. A standard weight for a tennis racquet is 300gr (10.6 oz). Any racquet below 290gr (9.8oz) is considered a light racquet and any racquet above 310gr (10.9 oz) is considered a heavy racquet. Usually heavy racquets are not recommended for beginners since they are difficult to swing and require good technique from the player. The lightest racquets aren’t necessarily the easiest for beginners also because you need to swing harder with these type of racquets and in doing so, accuracy and control may be jeopardized. In general, a heavy racquet is more powerful, more stable and transmits less shock than a lighter racquet. A lighter racquet is more maneuverable and thus, a player is able to swing it faster. When holding a tennis racquet it is important to consider how the weight is balanced. There are head -heavy racquets (more weight in the head) and head-light racquets (more weight in the handle). 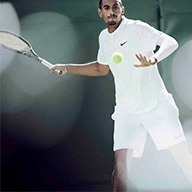 Professional players usually prefer head-light racquets since they are easier on the arm and offer great control, but the player has to provide more power and spin themselves. Head -heavy racquet on the other hand, are more maneuverable and offer more power since the weight is distributed on the head of the racquet which is the spot where the contact with the ball happens. Power and Control are directly related to the head size of the racquet. A large head size will provide power and a small head size will offer more control. A larger head size will also have a larger sweet spot (hitting area of the racquet where maximum response occurs). Racquets today are offered in head sizes that range between 85 to 135″ square inches but the most commonly used are between 95-110 sq. in. Oversize Racquets (106 – 118 sq. in. ): Ideal for beginners, players looking for power on long strokes and those physically limited. Also called Power Racquets. Midplus Racquets (95-105 sq. in. ): Used by intermediate and advanced players. Offers less power in compensation for added maneuverability and stability, a mix of power and control. Also called Tweener Racquets. Mid Racquets (85-94 sq. in. ): Usually used by players who have strong swings and those who can provide their own power. Typically these racquets have thinner, yet more flexible beams, a head-light balance to retain maneuverability and are heavier in weight. Also known as Control Racquets. A tennis racquet is completely useless without the strings. Think of it as if the strings to a racquet are like the tires to a car. Many players get really serious about picking the string that better serves their game since finding a perfect string can be a game-changer experience. Today there is a wide variety of strings to choose from, so it is important that you start knowing your needs and preferences when it comes to choosing a string. Playability: There is no general agreement about what makes a string playable since every player defines this term according to how good he/she feels it while playing, but usually a string is called “playable” according to the softness felt when hitting. The most common (and oldest) string under this category is the Natural Gut, made out of beef intestine, though string can be a little too expensive due to the high costs of manufacturing it, but there are plenty of other great affordable playable strings available at Tennis Plaza, such as: Wilson NXT, Wilson Sensation, Babolat X-Cel, Tecnifibre X-One Biphase, Dunlop Syn Gut and many others. Durability: Durable strings are usually made from rigid and less elastic materials such as Polyester. But there are also great durable strings made from Nylon. Unfortunately for tennis players, increasing durability to their strings will have the cost of loosing playability. Some great durability strings available at Tennis Plaza are the Luxilon Alu Power and the Babolat RPM Blast. Hybrid Stringing: A good way to balance playability with durability is by combining two different types of strings on a racquet. It’s common to see players using Polyester strings on the mains (vertical strings) and Synthetic Gut on the crosses (horizontal strings), this gives them both playability and durability at the same time. String Gauge: Refers to the thickness of the string. 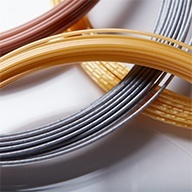 Thinner strings offer better playability while thicker strings offer durability. String gauges range in a scale from 15 (thickest) to 19 (thinner), with half gauges identified with an L after the number (example: 15L, 16L etc… a 15L string is thinner than a 15 but thicker than a 16). A thin string allows more spin because it chews the ball more at the moment of impact. String Tension: It’s a number expressed in Lb or Kg and it refers to how loose or tight the strings are on the racquet. One basic statement all tennis players must know is that low tension on the strings provides more power and tighter tension provides more control. 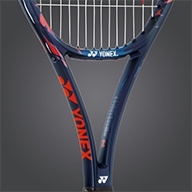 Every racquet has a recommended tension range printed on the frame which indicates the tension it should be strung at. This is usually a range of 10 units. We seriously recommend that when you are going to string your racquet, you do it within the racquet’s tension range, otherwise it wont perform as it’s supposed to and a very high tension might end up bending or even breaking the frame while stringing it. String Pattern: This’s how strings are laid out within the racquet’s frame and it tells you how many main strings are in relation to crosses. For example 16×18 means that there are 16 main strings and 18 crosses, 16×19: 16 mains and 19 crosses. Praxis says that the less dense the string pattern (lower number of strings) the more power and spin you’ll have in your stroke. Dense string patterns make more rigid stringbeds reducing the rebound energy applied to the ball but, enlarging string durability, on the other hand, open string patters will last less over time. Visit us online at www.tennisplaza.com or stop by our stores and let us guide you through. Choose from our broad selection of Professional Tennis Equipment Brands, pic and mix from our natural and synthetic string sets and reels to suit your preferences and play. Customize your racquet with hybrid stringing, shock dampeners, overgrips, make your racquet a real champion tool. Gear yourself up with the latest sportswear and accessories, be a pro. Only at Tennis Plaza.